Earlier this month, the Mobile County Communications District got its first look at a plan to utilize nearly $778,000 of leftover grant funding that’s been sitting untouched in a county bank account for more than a year. Originally part of a $3.6 million grant from the Alabama Law Enforcement Agency, the money was intended to fund a radio system that would allow first responders in Mobile and Baldwin counties to communicate with one another. While Baldwin County had its half of the system built by Motorola, MCCD opted to use its longtime contractor, Harris Corp. Ultimately, Harris issued a $777,925 refund for its work building that system, which to date has not been used in Mobile County. Though the project predates current MCCD director Charlie McNichol, he recently explained it “kind of got put in neutral” when the board decided to overhaul the county’s primary emergency radio network — a $40 million endeavor to build a P25 Phase II system Harris is still in the process of constructing. The MCCD board didn’t officially bring up the project or the leftover funds again with Baldwin County until December 2015, when Mobile County Commissioners said they would work with MCCD to find “an agreeable use” for the money. 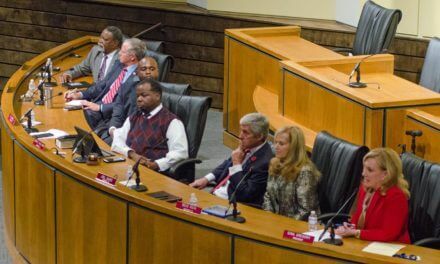 Because any use would require approval from ALEA, the process hit a significant speed bump when former ALEA Secretary Spency Collier was terminated in the midst of the scandal surrounding Gov. Robert Bentley and his rumored affair with a former adviser. Despite those setbacks, County Attorney Jay Ross said acting ALEA Secretary Stan Stabler had also been willing to let the county work to find a suitable use for the funds. However, because the use of grant funding comes with stringent oversight, Ross said the money “can’t be used for just any purpose.” That might also explain why the proposal the county unveiled Nov. 10 would accomplish little more than the grant was intended to four years ago. Rick Burke, a radio consultant for the county, said making the network function in concert with the $40 million system Harris is building would require upgrading it. However, representatives from Harris have already agreed to cover the $186,000 needed to upgrade the older system. Burke said once completed, a functioning interoperable system would allow regional communication between local first responders and those from state and federal agencies which might “provide assistance in the event of a large-scale disaster” such as a hurricane. Not only would the system give agencies access to a statewide network, but Burke said it would also prevent the primary emergency radio system used by first responders from being overburdened if the amount of radio traffic increases during an emergency. Depending on the cost of certain components, Burke estimated completing the interoperable radio system first sketched out in 2012 would use up roughly $615,000 of the $777,925 left over from the original grant. So far, MCCD hasn’t made a decision on the county’s proposed use for that funding, though the board is expected to revisit the issue at its December meeting. Harris Corp. says “stiff arms” it recently added should stabilize microwave dishes that originally failed to meet the federal standards for wind resistance, alleviating concerns MCCD’s $40 million 911 system might be rendered ineffective in winds stronger than 68 mph. The issue with the dishes was first raised in October by a consultant for the 911 board. However, on Nov. 10, Harris regional program manager Danielle Marcella acknowledged those “optional stiff arms” likely rectified the problem but also should have been on the microwave dishes the entire time. While the results of that engineering study may not be available for a few weeks, Marcella said the company is confident it has “remedied” the situation, adding that the configuration used on this project is the same Harris uses in other wind-prone areas like Florida and Kansas. Even MCCD board member Trey Oliver, who has been especially critical of Harris throughout the life of the current radio project, said he was appreciative of the company’s response to MCCD’s concerns. Ultimately, the fix did not cause a delay in the project or increase its cost. Still, due to a number of previous delays, the system that was originally intended to be fully operational two months ago won’t be up and running until March of next year at the earliest. However, as that “cut over” date to the new system gets closer, Marcella said Harris would have a full-time project manager in Mobile County to ensure the company gets “the most important” parts of the process right.